Rock Hostel v Miami, USA: Zarezervujte nyní! Welcome to Rock Hostel accommodations on a budget Redefined. Here, you get more, but still for less, even free breakfast. Think comfort, security, cleanliness, onsite restaurant/bar and easy access to a wide variety of fun tours and social activities, not to mention all the other wonders South Beach has to offer. Besides larger-than-usual rooms, Rock Hostel has plenty of unique hostel amenities that make your stay even more comfortable no matter how long your visit. Wi-Fi, communal kitchen, linens + towels, free computers with internet access, security card for guest areas, onsite bar/restaurant and so much more. We’ll even pick you up from Miami International Airport. It gets even better! 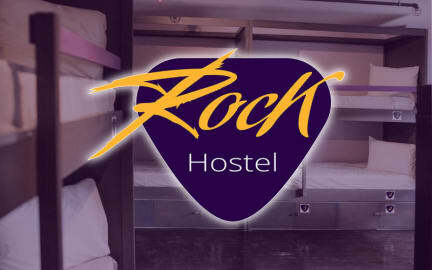 Rock Hostel features nightly events to popular South Beach nightclubs, loungers, pubs and the list of nightlife activities go on. With an expert staff in all things Miami Beach, not only can we advise you about what to see and do around Miami Beach and its surrounding areas, but you can also book amazing tours directly through us. Feel like sightseeing on a bike tour? No problem! Jet-ski rentals on your mind, just reserve your spot! From the Everglades to Key West to Villa Vizcaya museum, you can book your tours and activities right through Rock Hostel’s tour desk. The best part? You can count on discounted prices as well as transportation to and from. Rock Hostel’s Miami Beach central location is nestled right in the heart of the world-famous Art Deco District, a 20th Century neighborhood with hundreds of historic gems built in the 1920s thru 40s. The area is recognized by the National Register of Historic Places, with plenty to see including the Cleavlander, a 1938 hotel famous for its parties, bar scene and pool. Don’t forget to stop by Gianni Versace’s Spanish-style mansion, perfect for selfies. The Delano, Raleigh Hotel and Lincoln Road are within walking distance of the Rock Hostel, so make sure you visit because it’s where you want go. Think high fashion, celebrity DJs and everything in between. During the daytime, the Rock Hostel is your jumping off point. Enjoy the Miami Beach scenery while strolling among the pastel-topped skyline, unique boutiques for amazing one-of-a-kind shopping, sidewalk cafes, and of course the stunning stretch of beach at your feet—all within walking distance. Tour South Beach’s South of Fifth Street for people watching at its best. Think European models, the famous Joe’s Stone Crab restaurant and take a break from the urban hustle and bustle at South Pointe Park. Don’t think of Rock Hostel as just a secure place to sleep at night, our South Beach hostel (on 13th and the famed Collins Ave.) is a true Miami Beach experience for the young at heart. We offer superior hostel amenities, larger-than-usual dormitory-style rooms, onsite bar and so much more. Book your room today and get ready to enjoy the very best of Miami Beach. Our staff is well-versed in all things South Beach so you know you’re in for an experience of a lifetime. See you soon. Cancellations must be done by email. Late cancellations and no-shows will be charged the equivalent of the first night’s accommodation + tax. Please note we will preauthorize cards 72 hours prior to arrival for the first night of stay plus tax in order to guarantee you reservation. All guests must be 18 years or older to check-in. All Guest must have a government issued ID. Maximum stay 14 days (call or e-mail for exceptions). If you are in Miami for apx 2-3 days this is the place. Lots of thing to do around. 5 minutes from beach, bars ,clubs are everywhere as welk as supermarket. Wifi connection doesnt work upstairs which is only one disadvantage. Slightly more expensive but on the other hand you cannot expect cheap rate in place like that.